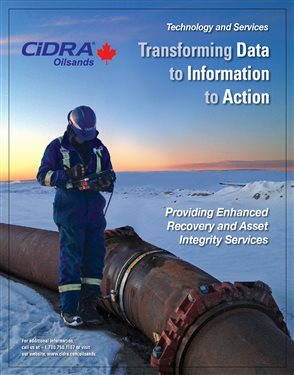 CiDRA Oilsands Ltd. has been a service and technology provider to the Mineable Oilsands Industry for more than ten years, providing industry-specific solutions aimed at increasing safety, reliability and recovery. CiDRA has built an award-winning team with a local warehouse in Ft. McMurray providing service and support - 24x7x365 days a year. SONARtrac® non-contact flow and entrained air measurement systems have fast become the standard for aggressive and difficult to measure slurry flows and have helped enable step-change increases in reliability and uptime for slurry transport pipeline systems. The passive sonar architecture has been extended to provide insight into the fluid dynamics of a slurry line used to detect the presence of a stationary sand-beds, partially filled pipes, and other conditions that impact operations. CiDRA’s slim profile HALO® SMARTring® tools and services provide on-demand, permanent, fixed pipe wear measurements. HALO services have been commercial for over five years delivering accurate, timely and consistent measurements even under conditions when a pipe is covered with sand or snow. Customers have realized immediate results in production uptime through the elimination of pipe ruptures; the reduction of maintenance costs through the extension of pipe life of up to 100%, and an increase in operating efficiencies through enhanced scheduling to help optimize turnarounds and pipe purchase acquisition costs. HALO measurement services have also contributed to the enhancement of process safety. CiDRA professionals, combining the unique measurements of SONARtrac velocity, entrained air, and sand-bed detection with the HALO SMARTring measurements are leveraging this information with its customer’s expertise to further understand the complex modes of wear degradation, including effects of erosion/corrosion, sliding and stationary sand beds. HALO has enabled the move away from “swimming in data” to transforming data to information to actions. CiDRA’s SONARtrac Flow Monitoring System is a breakthrough in full-bore, non-invasive flow measurement technology. By installing on existing process lines, SONARtrac clamp-on flow monitoring systems eliminate the process disruptions associated with installing other types of flowmeters. CiDRA’s SONARtrac flow technology represents an innovative new class of industrial flowmeters. This “sonar” flow technology utilizes array processing techniques related to those used in the field of sonar processing. CiDRA’s patented “sonar” flow technology was initially developed for flow measurement in one of the world's most demanding environments: downhole, offshore oil and gas production. 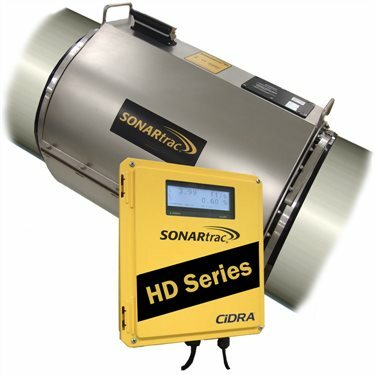 CiDRA has taken the proven reliability of its SONARtrac flow technology to address the challenging flow measurement needs of industrial processes.The SONARtrac Flow Monitoring System utilizes an array of sensors that are wrapped around the pipe. Flow rate is determined using CIDRA’s array processing techniques to measure the rate at which turbulent “eddies” inherent in virtually all industrial process flows, convect past the array of sensors. The flow rate is calculated directly from the velocity of the turbulent eddies. HALO®, powered by CiDRA’s SMARtring® technology, leverages active sonar and signal processingtechniques to provide permanent, fixed multipoint measurements around the circumference of the slurry pipe thereby eliminating manual point-to-point measurements. HALO SMARTring technology and service overcomes the deficiencies of traditional, manual UT methods used to measure pipe wear. CiDRA leverages its differentiated sonar and signal processing expertise to provide timely,accurate, repeatable pipe wear measurements and other relevant pipeline information and characteristics. The SMARTring pipe wear measurement tool clamps around the outside of the pipe and remains installed throughout the life of the pipe. On most larger diameter pipes, the SMARTring solution features twelve measurement locations, equally spaced around the pipe. “On-demand” a CiDRA technician connects a “smart” handheld reader-processor to each SMARTring sensor and records all twelve measurements simultaneously. Because measurement of all twelve points can be made virtually in seconds, tens of thousands of points on hydrotransport and coarse tailings slurry pipelines can be frequently measured, thereby enhancing predictive modeling and action by your pipeline and asset reliability teams.